Hammock beach hut in Cabo, Tayrona National Park. If I were to sum up Colombia in one word, “beautiful” would immediately come to mind. The northern coastline greets the Caribbean with its mixture of city and jungle. City centers are colonial and cobblestone, with large cathedrals touching the sky above beautiful squares. The mountains reach high (I write these words at 8,500 feet above sea level), their slopes lush with greenery, their valleys dotted with cottages. “Beautiful” would work in many ways. Then again, there are other hard-earned words often associated with the country, like “dangerous” and “impoverished.” But the FARC and other revolutionaries have reached a truce with the government. Still, just beyond those pristine city squares, only a few miles away, one often discovers ramshackle urban squalor and people struggling in a very serious way to survive. Colombia is more than just a beautiful tourist destination. Like any country really, it’s a place full of positives and negatives, a place on the rise and still entrenched in past struggles. It has been in the joining of these two poles, present and past, in the melding of the layers of history, where I’ve been most inspired by Colombia, and without a doubt, “inspiring” is a word also worth considering. 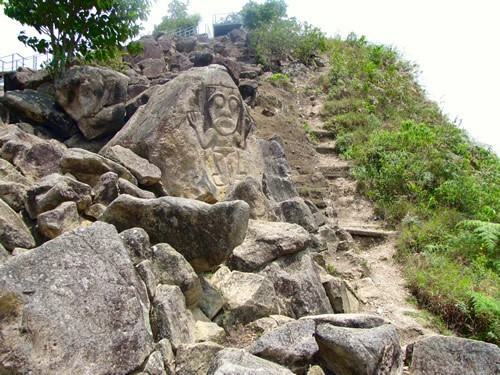 Among Colombia’s most memorable places to visit are those that predated Mr. Cristobal Colon (Christopher Columbus). Perhaps the two most currently renowned of these sites are La Ciudad Perdida (The Lost City), near the Caribbean coast, and San Agustin, where over 500 ancient statues have been unearthed (imagine Easter Island with more variety). La Ciudad Perdida, near the contemporary city of Santa Marta, was built over 1,000 years ago. The remains of the city can’t be reached by vehicle and require several days of hiking. The cost (roughly $300) for several days of hiking was beyond my budget, so instead I visited a less touristed place called Paso del Mango that required 30 minutes of hiking with no entrance fee. 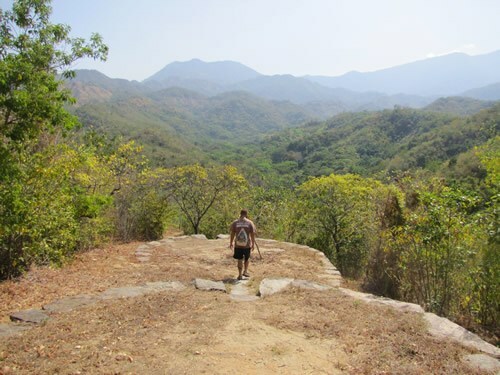 The area was covered in ancient stone pathways, staircases, and platforms, not to mention jungle, progressive farms, and a beautiful mountain stream that creates a waterfall. San Agustin is on the other side of the country, near the Ecuadorian border, a few hours drive away from Popayán, another great place to visit (details later). Carved by a north Andean civilization, the largest collection of religious monuments in South America can be found scattered among a spectacular landscape of mountains, streams, waterfalls, and pueblitos (little towns). Here I was able to visit the park proper (only $10 tariff), but it was a little more adventurous. It took a day to hike between the pueblos, where many of the statues remain in situ. Carved rock face near San Agustin. One other interesting pre-Colombian site I visited was Guatavita. In fact, I lived there for a month, volunteering on a permaculture farm, La Juanita Finca Verde. Lake Guatavita was (and still is) a sacred body of water for indigenous people, and due to ancient rituals in which golden objects were thrown into the lake, it also the site of the legend (one of many) of El Dorado. Ironically, colonialists spent far more money trying to find gold than they ever received from the gold discovered. From Bogotá, it’s possible to visit Guatavita (the lake and the town, a beautifully odd reconstruction of colonial town flooded in the 1960s due to the Tominé Reservoir) and the “salt cathedral” in Zipaquirá. In fact, the mountains around the capital city are filled with fantastic places to visit. You can also see some of the Guatavita’s gold at The Gold Museum (Museo del Oro) in Bogotá. As many of us are aware, in 1492, Columbus sailed the ocean blue, after which everything went—some would say—horribly askew. Indigenous populations suffered greatly from the “discovery” of the new world, and many great civilizations fell to colonizers. Unfortunately, that’s not exactly "ancient history," but rather something that still affects Colombia’s indigenous populations to this very day. Though the origins are tragic, one can’t help but admire the stunning architecture the conquistadors left behind. Colombia has its share of colonial memories and artifacts, particularly in the cities of Cartagena and Popayán. Cartagena is without a doubt one of the most stunning cities I’ve visited. To the north, the sea rolls in towards the historic center, where a walled city has been completely polished for tourism. A mix of stone and pastel architecture with narrow alleyways full of life: snow cone vendors tinkling bells, independent cafes in dim lighting, artisan shops stuffed to the gills with handicrafts, and juice bars bearing fruit on all sides. 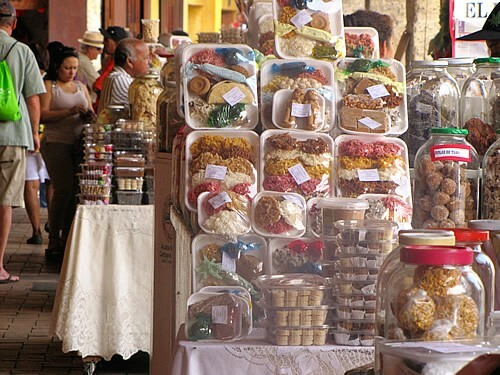 Street stalls selling coconut cookies in Cartagena. As a visitor, you should also be aware that beyond the walls of Cartagena the traffic becomes far more dense. Shiny shop windows give way to tarpaulin tents with knockoff products, and chic restaurants transform into dirty piecemeal shacks with gravel floors. Children are often caught leading lives very different from the Disney-like existence in the castles just a few miles down the road. Thankfully, organizations like Foundación La Vecina provide educational support, community projects, and medical aid to the children living outside the boundaries of the Cartagena most tourists know. Popayán, said to be the second most beautiful colonial town in Colombia, offers a completely different experience than Cartagena. Calming whitewashed architecture, churches around every corner, Popayán now thrives based on its relaxed atmosphere and its proximity to other great attractions. Visit the Tuesday market in Silvia, and the pre-Colombian sites at San Agustin and Tierradentro (yet another UNESCO World Heritage site). It’s a place to stop, literally and figuratively. 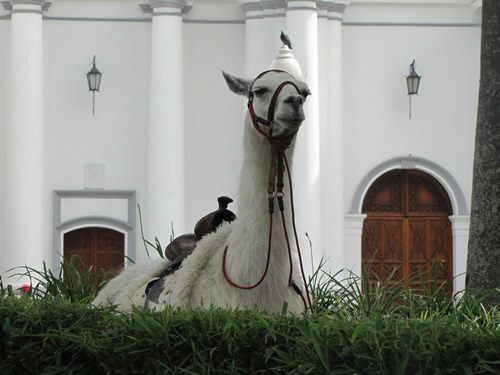 Llama in Parque Caldas of Popayan. An honorable mention to this list, but every bit as worthy of a visit, is La Candelaria in Bogotá’s historic center. It houses the very lively art and theater culture, (we’ll get into that in a moment), but it’s also the location of the oldest buildings in the city, dating back some 500 years. View of a Hilltop in La Candelaria, Bogota. Undoubtedly, Colombia’s struggles in the late 1900s still linger quite prevalently in many people’s minds. Up until very recently, it was a no man’s land on the tourist circuit, and without a doubt, some of those negatives still exist. However, what my experience of Colombia showed me is that, with a proper perspective, such negative images can be seen from quite different perspectives. Many travelers come to South America with the drugs on their mind, but this often revolves around visions of intensive use/abuse as opposed to being an actual attraction. However, in Santa Marta, a town otherwise not too inspiring, I stayed at a very interesting hostel, both for its mysterious, Australian name—Drop Bear—and its history. The hostel used to be a cartel’s house. On Sundays, the owner/operator (an Australian) gives a fascinating tour, revealing secret safes, safe rooms, and sordid stories. 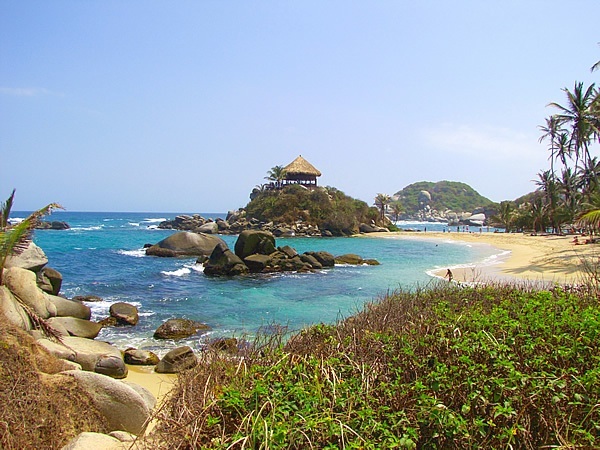 Tayrona (another UNESCO site) is a tribute to the country’s commitment to maintaining its natural gifts. There is a long stretch of Caribbean coastline where the beaches are largely untouched and jaw-dropping. Despite the potential, it has not been cluttered with resorts. In fact, most of the available accommodation involves sleeping bags and tent spikes, and that is only after hiking to the park for nearly an hour. Even so, it’s so spectacular that many people find their nature-loving souls awakened and manage to wander their way through the coconut groves. 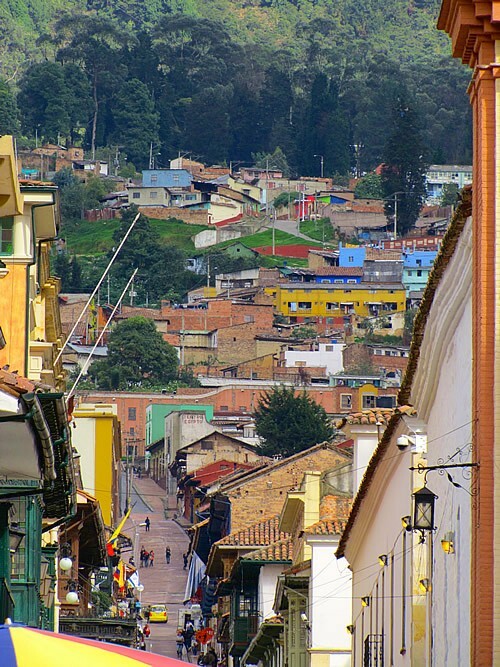 The previously mentioned La Candelaria in Bogotá is not just the oldest part of the city. It is the center of a massive art movement, particularly graffiti, which has become a major, respected medium in the city. (You’ll see massive murals from the moment you leave the airport.) In the last 10 years, graffiti has become so accepted that—rather than chasing artists off—police now actually guard top crews while they do their commissioned work. It has made the city a living, evolving museum. Take a tour—it runs on donations only. Commissioned graffiti by Rodez on one of the oldest buildings in Bogota. Without a doubt, my time in Colombia—over seven weeks—has only inspired me to want to see yet more of this seductive land. I know there are places that still warrant exploration, like a hard-to-reach spot near the Amazon: Leticia, which is famous for its pink river dolphins. There are the vast tropical plains throughout the central part (I’ve been invited), remote beaches near the Panamanian border, and Medellin, formerly known as the most dangerous city in the world, which has turned into the most the innovative city as of 2013. That’s one the paradoxes of traveling slowly as we did: you see and learn so much more, but it only makes you long for yet more time to linger and explore. In addition to physical beauty, Colombia proved to be among the friendliest places I’ve visited, particularly in Latin America. Quickly made friends shared their homes, their food, and their passion, from artisans to farmers to educational administrators. Tellers at the bus terminals looked out for me. Strangers went out of their way to make sure I got to places safely and easily. It was as if all that bad reputation had fueled a gentler, more embracing society, one that felt instantly comfortable. Such comforting warmth and hospitality, in itself, are beautiful feelings I imagine every traveler seeks. Guatavita: As mentioned, I volunteered at La Juanita Finca Verde, a permaculture farm/eco-guesthouse, which has a top ranking on TripAdvisor. 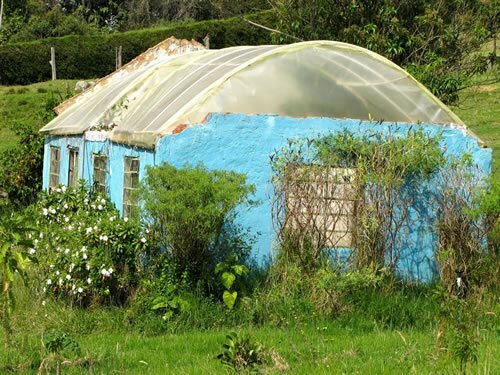 Greenhouse at La Juanita Finca Verde in Guatavita. San Agustin: A fan of the rustic and natural, in San Agustin, I stayed at La Casa de Francois, set above and with stunning views of the town. Standing in the "Mini Lost City" in Paso Del Mango. 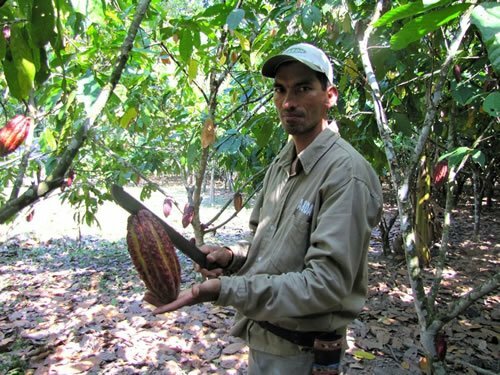 A cacao farmer explaining the finer points of turning the huge beans into chocolate. 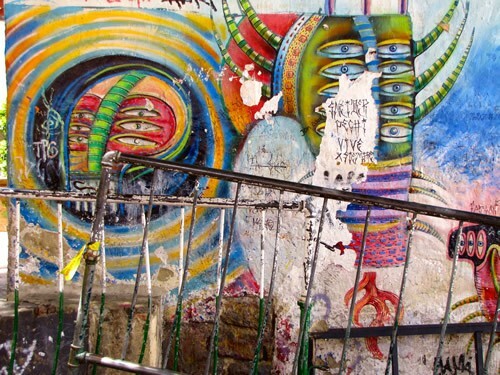 Bogotá (La Candaleria): Right off Plaza del Chorro Quevada, where the city began, Casa Bellavista doesn’t have the best vista, but is run by the nicest family, and really supports the local art scene—they commissioned graffiti artists to paint the façade of their hostel. Santa Marta: Not the most remarkable of cities, Santa Marta is nevertheless a great post for exploring some of the best spots in northern Colombia. Drop Bear Hostel was an easy, very inviting place to have as a base for further explorations. Popayán: Okay, truth be told, the owners of Parklife Hostel are old friends I worked with in Guatemala. Nonetheless, it’s a hip spot with unique pizzazz and reviews that don’t need my backing. Jonathon Engels, a Living Abroad Contributing Editor for Transitions Abroad, has been an expat since 2005, just after he earned an MFA in creative writing and promptly rejected a life teaching freshman composition. He has lived, worked and/or volunteered in seven different countries, traveling his way through nearly 40 countries between them. For more, check out Jonathon Engels: A Life Abroad or visit The NGO List.